Yucca refers to several species of North American shrubs and trees that are typically found in desert or mountainous areas. Collectively, the yuccas are known by many common names, including Joshua tree, Adam's needle, Spanish bayonet and Our Lord’s candle. Our yucca root comes from Yucca schidigera, a species related to agave that occurs naturally in the southwestern U.S. Also known as Mohave yucca, the dried root is traditionally used to make soap and other cosmetics. Powdered yucca root, a good source of vitamins and minerals, is encapsulated as a dietary supplement. Yucca schidigera is a flowering plant of the Asparagaceae family. Yucca is a small evergreen tree capable of reaching a stature of 16 feet (5 meters). Rising from its conspicuous basal trunk is a dense crown of spirally arranged leaves. The plant's gray-brown bark is covered with brown dead leaves near the top, and is increasingly irregularly rough and scaly-to-ridged closer to the ground. The	plant's thick leaves are 30–150 cm long and 4–11 cm broad at the base, concavo-convex, and are yellow-green to blue-green in color. The rigid leaves appear long and pointy similar in shape to bayonets with their wider base tapering to a narrow top. The bell-shaped flowers are white, sometimes tinged purple, and approximately 3–5 cm long (rarely to 7.5 cm). 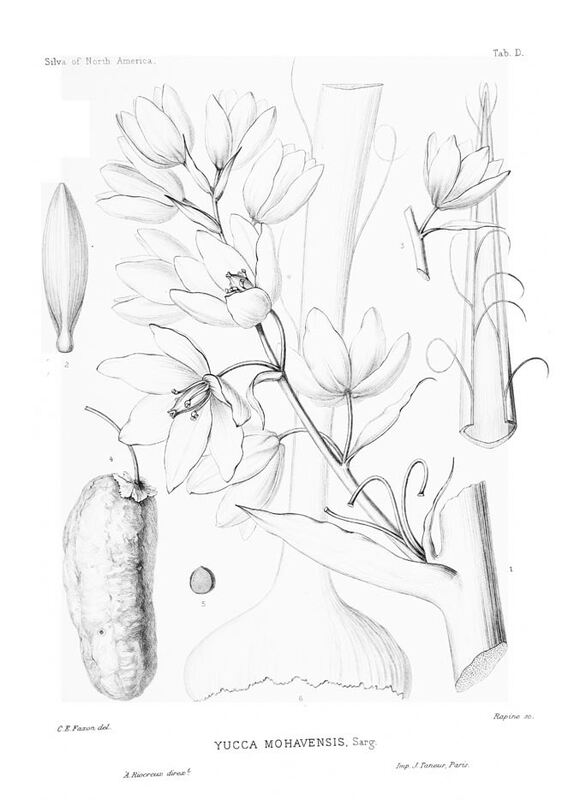 They form in compact, bulbous clusters 60–120 cm tall at the top of the stem. The fruit is an elongate berry, up to 11.5 cm long. Yucca is the Central and South American name for the cassava plant. It is taken from Spanish yuca, juca (late 15c. ), probably from Taino which is the native language of Haiti. Yucca schidigera is native to the Mojave Desert, Chihuahuan Desert and Sonoran Desert of southeastern California, Baja California, New Mexico, southern Nevada and Arizona. Yucca grows in desert climes on rocky slopes and creosote flats. It enjoys altitudes between 300–1,200 meters (980–3,940 ft) and full sun. Yucca plants will thrive in any soil but prefer a sandy loam. The plants prove to be hardier when grown on poor sandy soils. 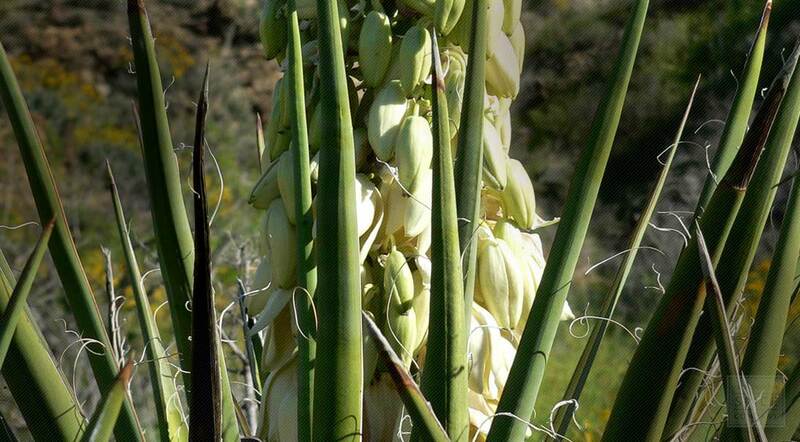 Once established the yucca plant is very drought tolerant. Sow seed in spring in a greenhouse. Pre-soaking the seed for 24 hours in warm water may reduce the germination time. It usually germinates within 1 - 12 months if kept at a temperature of 20°c. Transplant out the seedlings into individual pots when they are large enough to handle and grow them on in the greenhouse or cold frame for at least their first two winters. Plant them out into their permanent positions in early summer and consider giving them some winter protection for at least their first winter outdoors. When the plants mature, harvest yucca root in small amounts so as to preserve the main plant’s health and vitality.Dry the root for later use. Store dried yucca root pieces and dried yucca root powder in an airtight container in a cool, dry place.